ACT Health Minister Meegan Fitzharris speaking with one of the patients in the refurbished ward. Photo: Supplied. A newly renovated 26-bed ward which includes a high observation unit has been opened in Canberra Hospital to cater specifically to the needs of elderly patients requiring specialised care. Elderly patients recently moved into the Acute Care for the Elderly Unit (Ward 11A) which took just over a year to refurbish at a cost of around $4 million. The ward aims to provide individual care for patients such as those living with dementia, suffering cognitive impairments or exhibiting challenging behaviours. It endeavours to provide an environment which is safe and secure and promotes independence. ACT Health Minister Meegan Fitzharris visited the refurbished ward late last week to meet with patients and clinical staff. Ms Fitzharris said the newly refurbished ward had been specifically designed to make it easier to care for elderly patients and ensure they can move around the ward easily and safely as they recover. “It has 26 bed spaces, which allows for flexible placement of beds, new bathrooms that use light and colour to assist patients with cognitive impairments, and a new seven-bed high observation unit,” Ms Fitzharris said. “The ward will also soon have a refurbished courtyard to enable purposeful walking, to help patients get their mobility back. “Furnishings and fittings chosen for the unit, including the use of contrasting colours and special signage, support the independence of patients who are vision-impaired or living with dementia,” she said. Ms Fitzharris said that the new design also enables functional separation of patients with challenging behaviours and delirium. “This will assist with monitoring and observation and improve nurse-patient interaction while ensuring staff and patients are safe. “I’m really pleased that this ward is now open, as some of our most vulnerable members of the community are cared for in this unit. It is difficult to accept that instead of creating a purpose built facility the decision to 'improve' the existing ward was made. My father was placed in a 'dementia' ward even when he wasn't suffering this condition, he only needed a hospital bed for oxygen and help getting up to the bathroom etc. Many of the patients in this ward were noisy, unpredictable and not bed bound, so sleeping was impossible. 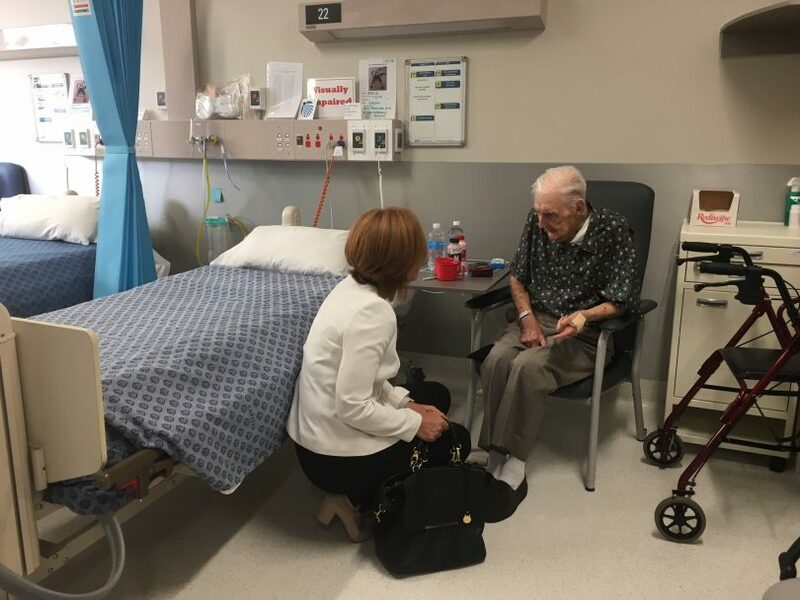 I know that there are big problems with health care for the elderly, but the very least we should be able to manage for them is a hospital bed for their health problem not in a general aged care ward. The other issue that really pissed me off was the fact that he had private cover, but was forced to stay in a public ward, because there were no staff to cover the private wards???? What's the point of private health insurance when you don't get to use it when you need it?????? This was the oldest area of the hospital and it's finally been cleaned up. So let's hope it's not just the furniture that's been updated and they've put on more staff to do the basics (like more than one wash every two days). My advice is, if you love your parents and there's a chance they can recover with hospital care, and do not have dementia, never let them go into the geriatric part of the hospital as this is pretty much a glorified nursing home with a daily heavy handed push to place the elderly into any local nursing home as soon as possbile rather than look at medical interventions. Our elderly deserve the best, Thank You Canberra Hospital! I would like to see more regulation over care facilites and less for profit organisations running them.